In 2012 when Design & Technology teacher and design engineer David Meiklejohn retired early from teaching he set up DS Meiklejohn Creative Solutions Limited, offering a bespoke design and consultancy service. As a part of that he took on a busy blinds and window coverings franchise with Hillarys. He quickly developed a strong base of happy customers across the region who appreciated David’s calm, patient, approachable manner and meticulous attention to detail. 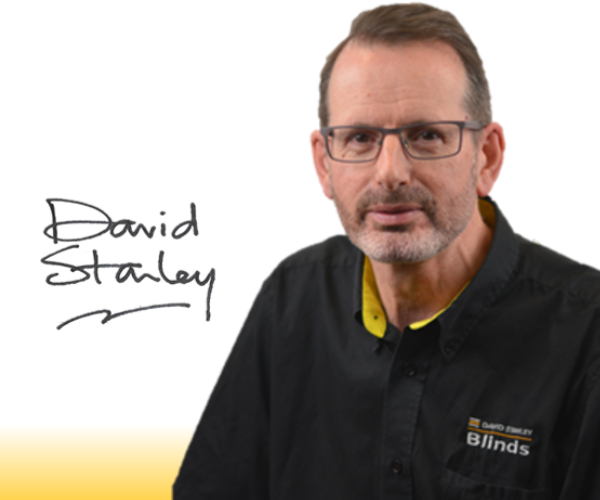 Having traded with Hillarys and become very well established in the blinds, shutters and curtains industry it became obvious to David that he could offer customers a much-expanded range of beautiful quality products, more customer choice, and an even greater emphasis on personalised service and value if he became independent from the franchise and, by popular demand, David Stanley Blinds was born. Based centrally in the North East we are happy to travel to anywhere within the region where our expertise is needed, visiting customers from Alnwick to York - covering Hexham, Prudhoe, Ponteland, Newcastle, Gateshead, Durham, Chester-le-Street, Crook, Bishop Auckland, Wolsingham, Weardale, Darlington, Richmond, Leyburn, Bedale, Thirsk, Northallerton, Ripon, Harrogate, York - and everywhere in between. Contact us for a free home consultation appointment at a time that best suits you.